Shawn Callahan, son of Charles & Shelley Callahan, husband of Erica Callahan. 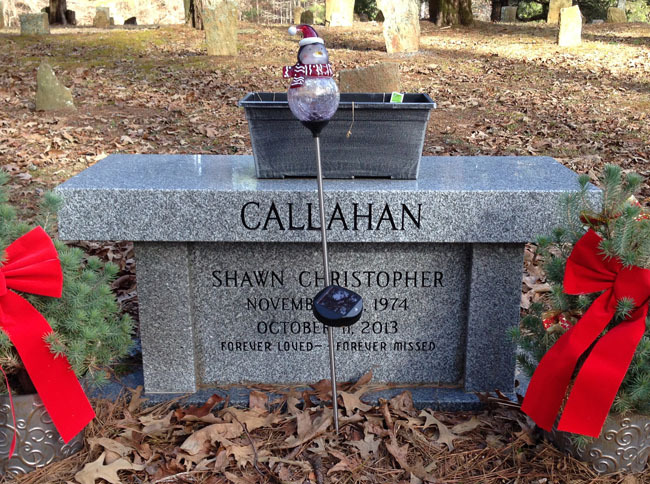 Shawn Callahan, 38 of Canton, Ga. passed away on Friday, October 11, 2013. Funeral services are scheduled for 1 p.m., Friday October 18, 2013 from the Darby Funeral Home Chapel with Dr. George Anderson officiating. Interment will be in the Macedonia Campground Cemetery. The family will receive friends on Friday from 11 a.m. until funeral hour. Survivors include wife, Erica Callahan, Canton, Ga.; parents, Charles & Shelley Callahan, Waleska, Ga.; daughters, Alyssa Callahan, Douglasville, Ga., Kaya Harris, Catherine Harris, Abigial Harris and Aelan Harris all of Canton, Ga.; sister, Jessica Callahan, Woodstock, Ga.; grandparents, Charles & Audrey Callahan, New Smyrna Beach, Fla.; Irene & Jim Cassidy, Rapid City, S.D. ; Alden & Marilyn Loraas, Casper, Wyo. ; mother-in-law, Barbara Vance, Canton, Ga., aunts, uncles and cousins also survive. Flowers will be accepted or donations may be made to the First Baptist Church Canton, 1 Mission Point, Canton, GA 30114.